There are quite a lot of large crypto currency exchanges that are focused on the mail crypto currencies such as Bitcoin, Litecoin, Ethereum, DOGE and a few more. When talking about altcoins however there are not that much options available that have a large number of coins available for trading, especially when talking about more recent coin launches. The first two large ones that come in mind are of course Bittrex and Poloniex, but getting an altcoin listed there and keeping it long term may not be that easy. So here comes YoBit, one of the biggest altcoin exchanges at the moment that currently has 467 active trading pairs and and some daily trading volume on at least half of them. 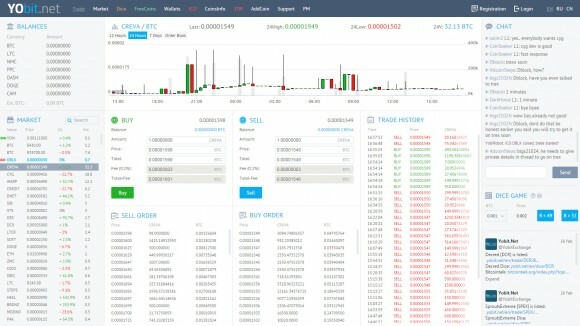 It is not just an crypto currency exchange however, as on YoBit you also have a built-in Dice game that seems to support all currencies in the exchange, free coin giveaways for many coins with the ability to claim free coins as well as to donate coins for the giveaways, there is even a coin info database to help you easily find more information for an altcoin you might not be familiar with. The exchange is also running coin ICOs as well as has free and paid listing options available for including new coins, something that can be useful for new coin developers that want to get their new project up and running on an exchange. Mintpal, once one of the top exchanges for altcoins, is now suffering a lot of problems since it has been acquired by Moolah and the new version 2 of the exchange was launched. Users are still complaining of having various issues with the V2 exchange such as not being able to log in, resetting the password may help for some. When successfully logging in some users are finding out there is no history for their trades or their coins not available in the account on the V2, and even if the coins are there initiating a transaction may result in the coins not appearing in their wallets at all. 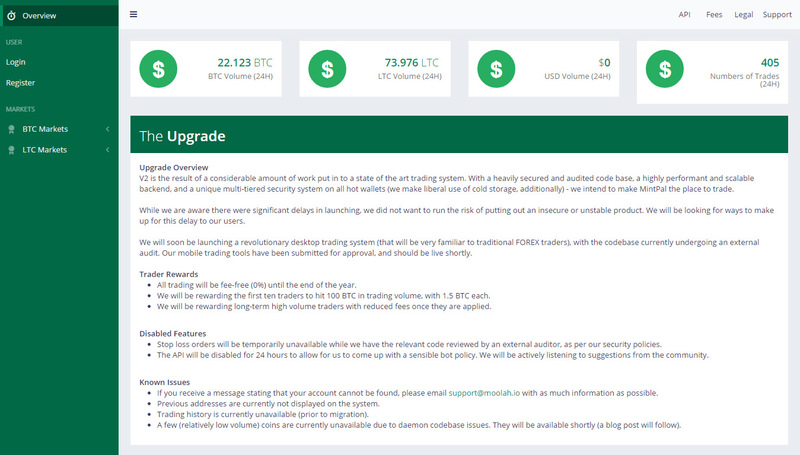 You can now say that Moolah has kind of killed everything that the old Mintpal has built and now they need to start bringing back users and rebuilding their trust if they wish to make Mintpal back what it was. If you currently look at the 24 hour starts of the exchange you can see that the number of trades and the volume is still very low, though there is some improvement compared to the even lower numbers from yesterday. The fact that there is no exchange fee until the end of the year and that Moolah has announced some awards for traders does not help much unless they are able to quickly resolve all of their issues and they still seem to have a hard time doing so.